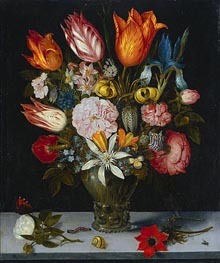 Ambrosius Bosschaert the Elder (Antwerp, January 18, 1573 - The Hague, 1621) was a still life painter of the Dutch Golden Age. 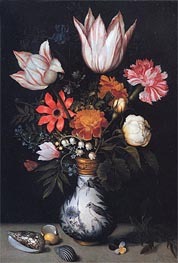 He started his career in Antwerp, but spend most of it in Middelburg (1593-1613), where he became dean of the painters' guild. 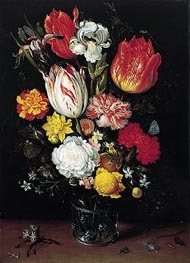 He later worked in Amsterdam (1614), Bergen op Zoom (1615-1616), Utrecht (1616â€“1619), and Breda (1619). 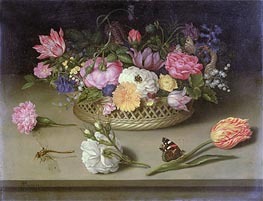 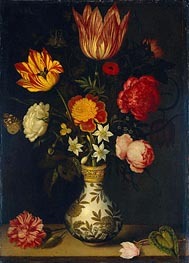 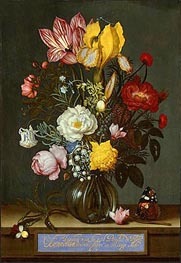 He specialised in painting still lifes with flowers. 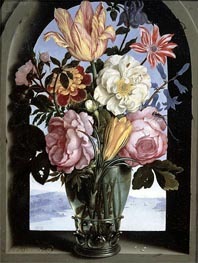 In 1587, Ambrosius Bosschaert moved from Antwerp to Middelburg with his family because of the threat of religious persecution. 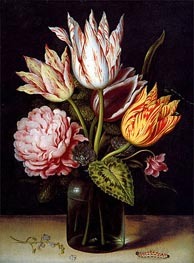 At the age of twenty-one, he joined the city's Guild of Saint Luke. 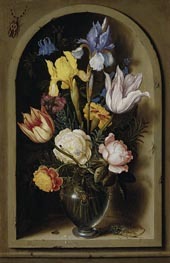 Not long after, Bosschaert had established himself as a leading figure in the fashionable floral painting genre. 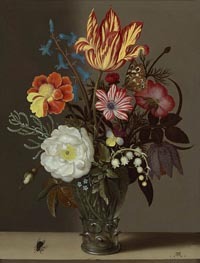 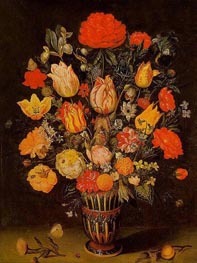 His bouquets were painted symmetrically and with scientific accuracy in small dimensions and normally on copper. 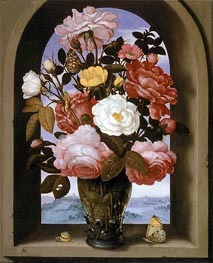 They sometimes included symbolic and religious meanings. 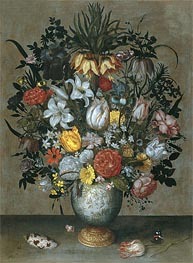 At the time of his death, Bosschaert commanded a thousand amateur painters for the production of one floral painting. 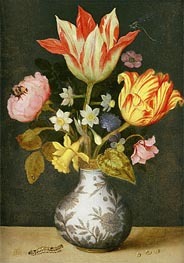 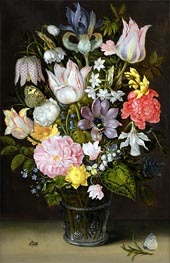 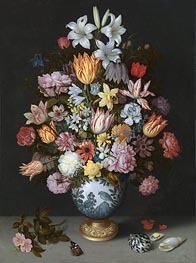 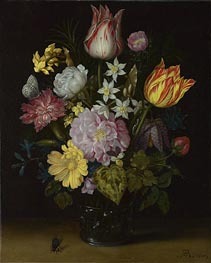 Bosschaert became one of the first artists to specialise in still life, and in doing so he started a tradition of painting detailed flower bouquets, which typically consisted of tulips, roses and an exotic species. 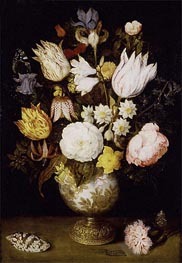 His sons and his pupil and brother-in-law, Balthasar van der Ast, were among those to uphold the Bosschaert dynasty which continued until the mid-17th century. 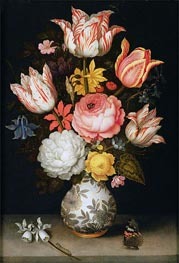 It may not be a coincidence that this trend coincided with a national obsession with exotic flowers which made flower portraits highly sought after. 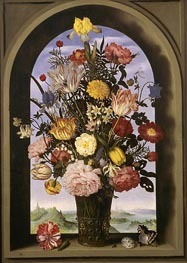 Although he was highly in demand, he did not create many pieces because he was also employed as an art dealer.